September 2 - As we left Mills Creek, we were once again reminded of the large ships in the area. The one to the right is a tow. In other words, the vessel in the front is pulling the one in the rear with a large cable. 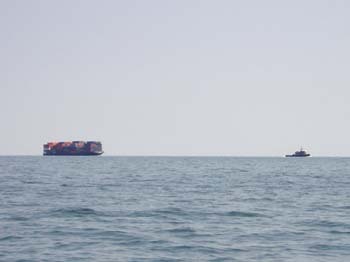 I'm sure there is a formula for how far back the container is from the front one and probably based on the load and sea conditions. However, I don't know what that is, sorry. 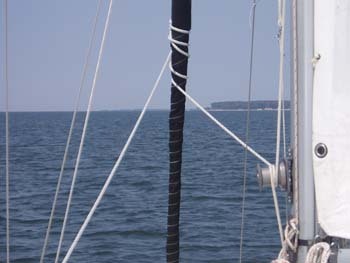 We motored all day into a light wind and ended up anchoring in Reedville, VA. 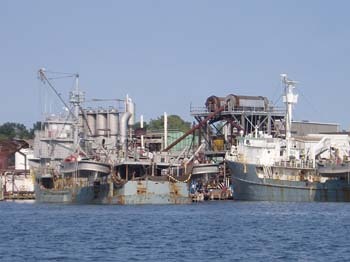 This is the home of the fishing ships which use nets to catch fish and then return them to the fish processing plant you see in the picture on the lower right. We chose our anchorage based on the wind conditions - not for protection from waves, protection from the steam and smell coming from the plant's stack. To the lower left you can see a picture of some of the older fishing boats that appear to now be abandoned. After anchoring and ensuring we were not moving, we put the dinghy engine on and headed into port. 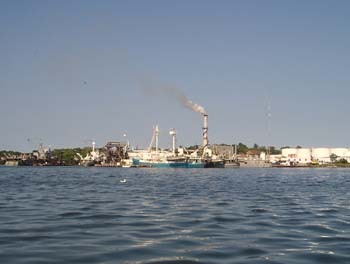 As you can see to the left, there are some big ships in the area that service the fish plant. 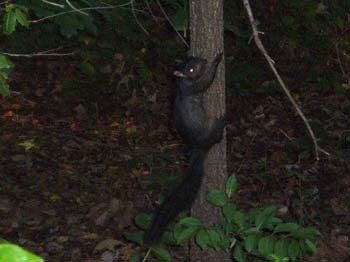 They also move all day and night during season. To the lower left, you might be able to make out the smaller boat that is suspended from the rear side of the rusting ship. This is the boat they use to take out the nets. All of their "fishing" is also aided by spotter aircraft which appear to be Cessna 182's which also take off from around Reedville. Sounds like they are cheating doesn't it? 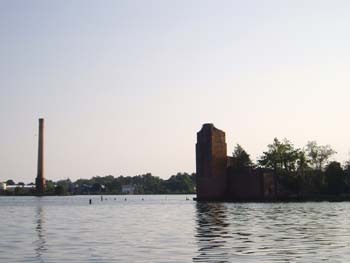 To the lower right, you can see an old stack from a former fish processing plant. In the "old days," there were many more boats and many more plants. It now appears the future of Reedville is similar to all of the other small towns in the area - build more homes and probably condo's in the future to attract the good old tourist dollar. 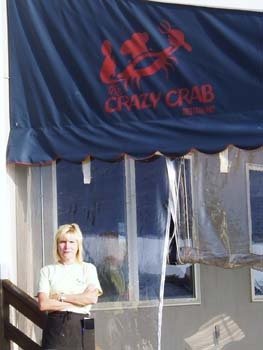 In the guides we have on the boat, it was noted that you could dinghy into Crazy Crab's and have lunch or dinner. We decided that was the place to go after all we are a bit crazy ourselves. We had a delicious meal and wonderful service by Terri who is pictured to the right. At first she didn't want me to take the picture but after my pleading and explaining that I try to put everyone on my website, she finally consented. Regardless, the meal and service were great and if you are in Reedville, you might want to stop by. They didn't have outrageous dinghy fees the way the last place we stopped did. 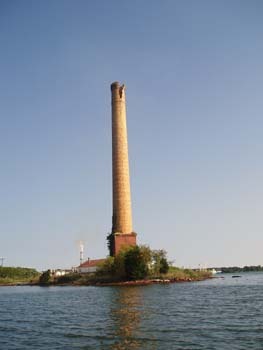 As we returned to the boat, we got the picture you see to the lower left which shows the stack you saw previously and in the foreground are the remains from another old processing plant. I just think it would have been very interesting to see this town at its peak! 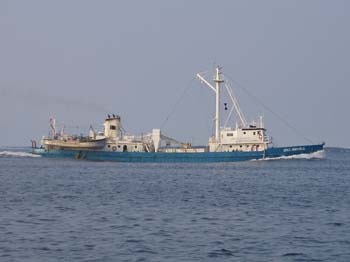 Below right is a picture of one of the fishing fleet as it was returning from, what appears by how low it is sitting in the water, a very successful trip. As this ship was coming in, another was going out. We arrived in Solomon's Island, MD and both of us had colds. We stayed on the boat the first day to try and recover. The next day, I rebuilt the derailers on our bikes in the morning and then we went off to the grocery for some restocking of our pantry. In addition, I've ordered 60 feet of high test 1/4 inch anchor chain to replace the 40 feet of 5/16 inch chain we now have on the boat. Our chain is rusting and after 11 years, in need of replacement. Rather than going back with the same chain, I went with the 1/4 inch so that we would have more chain at the same weight and used the high test so it would also be the same strength. Of course I had to use a higher grade shackle over the standard shackle so I would have the strength there too. Hopefully, the chain will be here when we return from Washington DC. It seems that West Marine is out of chain even at their warehouse. To the left you can see a picture of a black squirrel we saw on Friday night coming back from the Naughty Gull. I hadn't seen one and this was my first. Yesterday I picked up a Maryland fishing licence which was really cheap for out of state - $15 for the rest of the year. The Spanish Mackerel are running and we should be able to catch some when we depart on Thursday for DC and of course when we come back this way again. It will be fun fishing again and hopefully we can put some fresh fish onto the dinner plate. So far, we are still getting over these colds and spending quite a bit of our days just laying around. Hopefully we only have a few more days of drainage before we are both feeling better. September 5 - Yesterday, Monday, we decided enough with being sick. We took our bikes and rode about 2 miles to a great little lunch place. 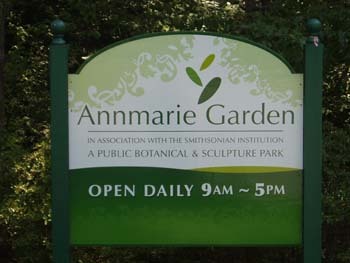 After a light lunch, we then returned to Annmarie Garden which we passed on our way. 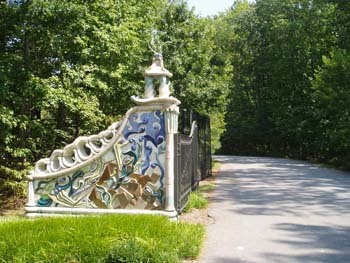 We didn't know about this garden and found out it was associated with the Smithsonian. It ends up it was a botanical garden and sculpture park. It was pretty cool because it had an asphalt path which we could ride our bikes on. 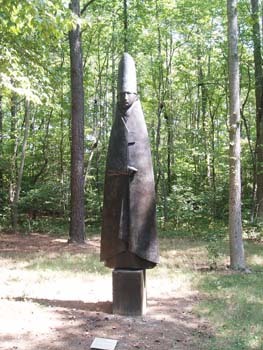 We viewed all of the sculptures that had been placed throughout the forest area. 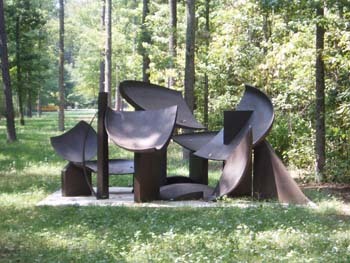 There were many different bronzes and other steel structures. Below, you can see the two entrance structures which are in themselves impressive. I'm not a great art person and that is something I'm trying to appreciate more on our cruise. I found the displays interesting and found the medium each artist was working in was interesting in itself. However, I'm not sure what each one was trying to create but I guess that is why we are going anyway. This sculpture I understood.... Duh.... 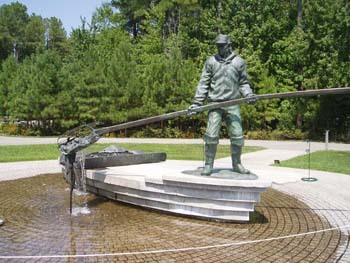 It represents a person manually dredging for oysters. 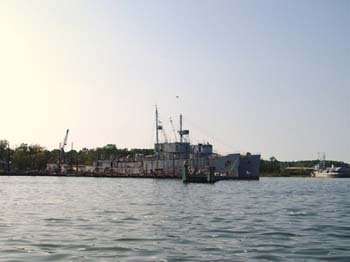 I would imagine the idea of using a long wooden pole with a steel dredge on the end from a boat would be a physical experience most of us could not accomplish. They would have to drag the basket along the bottom and then pull it up to then sort our what they found. 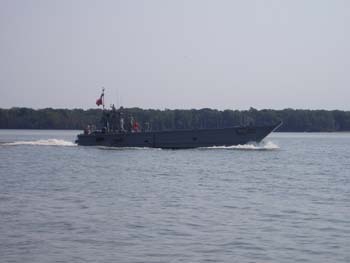 Today, they still use a steel dredge but they are allowed to use a winch powered by the engine. We saw people dredging on our way out of Norfolk this time. They would anchor and drop the dredge, pull it back up, empty it and drop it again. Over and over and over........ I guess when they stop getting oysters, they re anchor and do it all over again. Sounds like tough work even today to make a living. I'm sure it takes a special person to do this successfully. Today, Tuesday, I started the day by changing oil in the outdrive and the transmission. I was a bit overdue for the change and the water was calm so I was able to use my bucket with many trash bags and get out in the dinghy to drain the outdrive oil. Fortunately, I didn't spill a drop in the bay. I take the oil in the water thing pretty seriously since we are out enjoying nature. So far, so good on our oil changes. You have to be careful and you have to do it slowly to ensure you don't mess up. Tomorrow, we will be doing some final provisioning, pump out, fill the water tanks and finally take care of filling up with fuel. 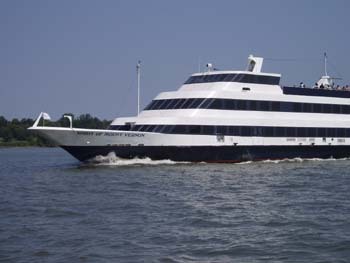 We will re anchor in a spot that allows us a quick exit and then we will be off for Washington DC on Thursday. It will take us two days for the trip up the Potomac River and my computer tells me we should have a bit of a push going up the river rather than a current against us. Looks like we planned the trip for the right time. More from us once we get to Washington. 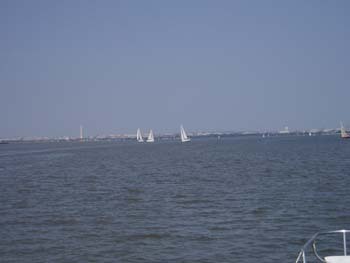 September 7 - We left Solomon's Island on Thursday morning and after 2 1/2 hours we turned up the Potomac River. After about an hour, we passed the spot where the German U-Boat sank during WWII. As I heard the story, they were trying to make their way to Washington, DC but of course they didn't have good charts. Evidently that did them in. I'm not sure what happened to the crew but you can actually dive on the boat by permit if you want to arrange it through a dive shop and don't mind the 2 foot visibility in the water. Below left you can see the view off of the front of our boat of the U-Boat site as we motor sailed up the river. 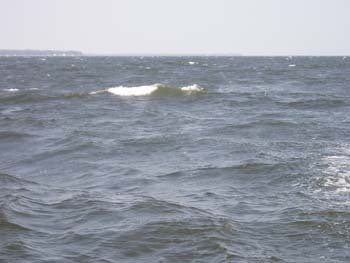 As the day went on, we encountered more wind than NOAA said would be there and fortunately, it was from behind. The camera always flattens waves although these weren't too bad going with you. About 2 foot or so. At times we were making up to 8 knots and probably we should have just turned off the motor and simply sailed. However we were fighting a current from the opposite direction and I had dreams of getting to Washington in 2 days. Sept 9 - After looking at the current charts and given the distance we had to go, we decided that we would stop early and go into Washington on Saturday. It was a great thing we did stop, otherwise we wouldn't have met some great people. 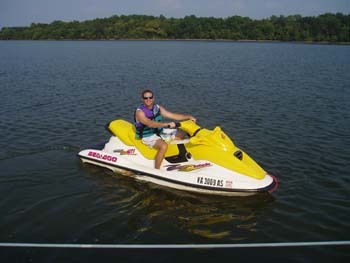 We had two people stop by on a jet ski and asked us about the boat. Deb found out the water was great for swimming so in we went. We had told them in the conversation that we were parrot heads and in about 30 minutes, Jeff, to the right, was shuttling people over to see our boat and our bird. Of course they came bringing gifts, Margarita's, and I put on some Buffett music. We had a great time talking about what they did for the military and of course they were interested in our living on our boat. Meet, left to right, Stephanie, Gary, and Audrey. Like I said, we had a great time talking with them. Thanks for stopping by. 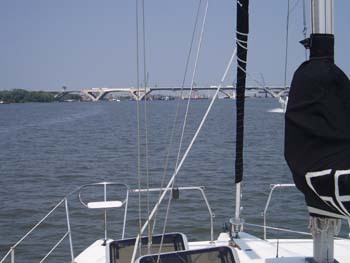 When we got underway the next morning, we encountered more vessels than we had coming up the Potomac. The one on the left was heading south. We always wave at the military people we see and they were waving back as well. I truly appreciate what each and every person associated with the military does for our country and the attitude they have. In addition, we watched the tour ship, to the lower right, leaving Mt. Vernon and when it was came back, we passed it on our port side. 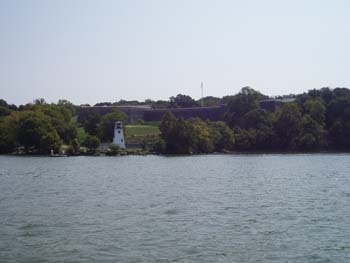 As you turn the last major bend to head to Washington, you will see this old fort on the right hand side of the river. I knew already that Deb wouldn't be interested in touring the fort but it was great to see as we passed. I'm happy they didn't have their cannons armed and ready to fire. Of course we are flying an American Flag but it was clear the placement of the fort was strategically correct. They could see up and down the river because they placed the Fort in the bend. On Friday I was reading in one of my guides and found a section saying because of the new Wilson bridge construction they only had 45 feet of clearance. Oops, I am 46 feet and change. I called and ultimately talked to the manager in charge of building the new bridge. All the guides are WRONG! Now the clearance for the bridge is 83 feet. This is great news for all sailors because they won't have to schedule an opening and then go through in the middle of the night. 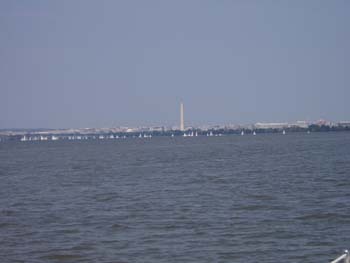 It is now much easier for sailors to get into D.C.
After we passed the bridge we could see in the distance the Washington monument and the Capitol building. We are getting closer. Of course we could also see a sailboat race we had to go through. 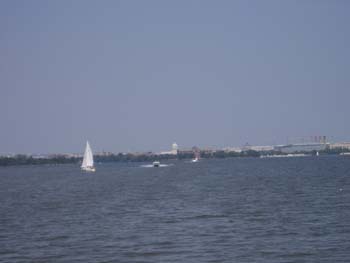 To the left you can see a better picture of the Washington monument along with another sailboat race that we didn't have to go through. 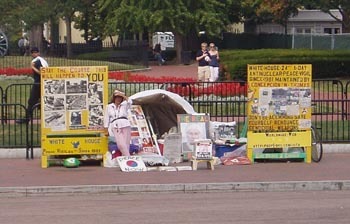 Lower left is a picture of a plane leaving from the airport next to the Pentagon. Lower right is the direction we are heading. 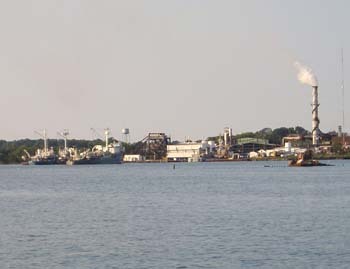 The capitol building is in the center and to the right is a Naval Air Station. There is a great deal going on around this town and the activity is pretty amazing as we are approaching. Freedom Arrives in Washington, D.C. When you arrive in Washington, it isn't as simple as throw out the anchor. However, it isn't that bad either. 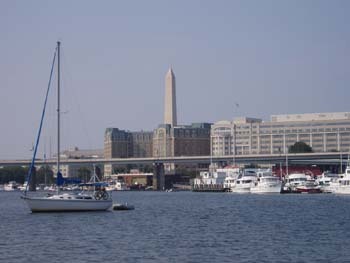 They require that you put out two anchors and then call the D.C. Harbor Patrol. Their number is 202-727-4582. 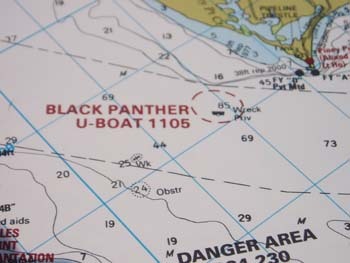 You will be asked to provide them your boat name, identify where you anchored in the Washington Channel so they can look at you with their cameras, tell them the number of people on board, provide your mailing address, and finally let them know how long you would like to stay. Typically, you are only given permission to stay one week and then you have to call back to get an extension. However, I guess because we are now out of holiday season, I was able to get permission for our two week stay up front. Below left is the view off of the back of our boat. 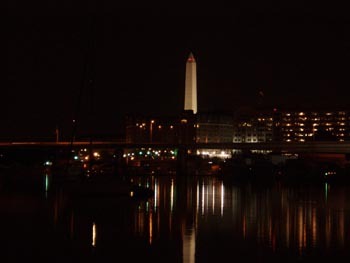 It is pretty cool to be looking at the Washington monument whenever you look outside. 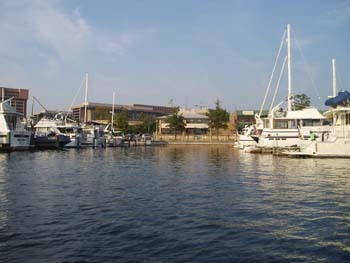 To the right is the passage between the D and C docks for the Capital Yacht Club and the way to the dinghy dock. 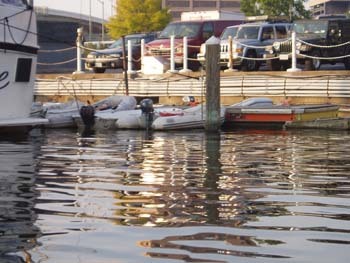 The dinghy dock is on D dock and is very convenient. I had called a couple of days ago about anchoring out and use of their facilities but didn't get the information that I would have to call when I arrived. Ends up, it wouldn't have mattered anyway. The person who was working wasn't there so something must have gone wrong. Regardless, we were able to meet a bunch of people trying to get registered. This doesn't normally happen but in our case I actually happy that it did. Like I said, we ended up meeting a bunch of people who really went out of their way to try and help us. Several of them were on the board of the Yacht Club and in the end, we were able to use a key for the facilities, docks, and a welcome packet showing us some great information about the town and services we will need. 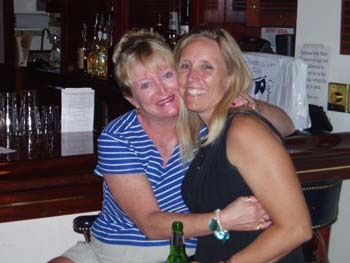 Lower left is a picture of the Yacht Club and to the lower right is Deb and Linda. Linda ran up about 20 minutes of cell time trying to track someone down for us to get registered. We met back up with her later in the evening at their bar. 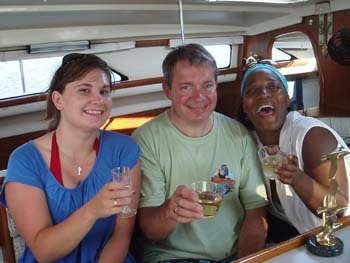 We were welcomed very quickly since they are used to talking to transient cruisers and welcoming them into their club. Very friendly people and great facilities too. Sept 10 - Sunday, we walked to the Mall. Oops, not the right decision. We should have taken our bikes ashore and ridden them but we were warned there wasn't a place to store them so we thought walk. Well, wrong decision. Tomorrow we will take the bikes and simply store them in the dinghy at night with a cable through them locked to the boat. Enough about logistics. 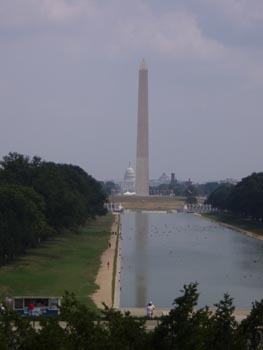 We walked up to the Washington Monument and found it to be similar to the Arch. Very unique, one time construction, however, probably not as challenging since there is only one base instead of two and you don't have to join at the top. 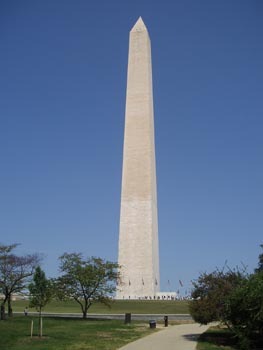 We are planning on going up in the Monument tomorrow morning. From the high point at the monument we were able to get a picture of the Lincoln Memorial, to the lower left, and the reflecting pool. Again, we will visit this tomorrow and close-up pictures as well. 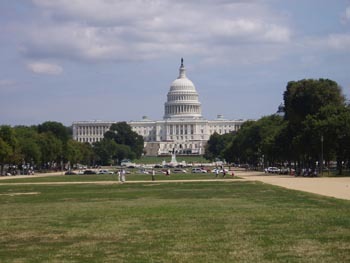 Of course, you have to also take the picture of the Capital Building. It is a very imposing and impressive structure. We have some possible lines on tickets for a tour, who knows? Then we stopped by the Hirshhorn Modern and Contemporary Art Museum. This was a great visit. We had a tour of the museum which in essence was Art 101. I have to also say that we were the only ones on the tour so it was highly interactive. I learned more about art in the 45 minute tour than I've ever learned in my lifetime. 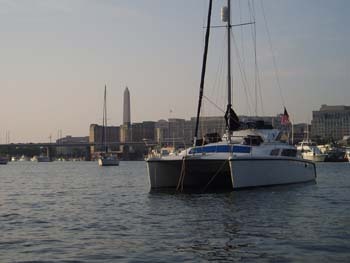 I'm looking forward to the tours at the other museums as we move forward in our s/v Freedom tour of Washington, D.C. I woke up during the night and it was an unusually calm evening. As I looked off of the back of the boat, the view was simply amazing. Therefore, I rubbed my eyes and got out the camera and tripod to take a bunch of pictures. The one to the left is one of the best of my time exposures. I have to tell you that I truly miss my good camera. Unfortunately, but when you hear the story, fortunately, they still haven't fixed my camera. I just received an email and the company taking care of my repair just sent the camera back to the factory for repair. I guess that is good news but it will take another 6 weeks to get it back. I guess this is one of those times that the 49 buck insurance policy pays off. Regardless, this is really a pretty cool picture from a camera I picked up at a pawn shop. Monday, Deb and I took the bikes in and made some rounds. 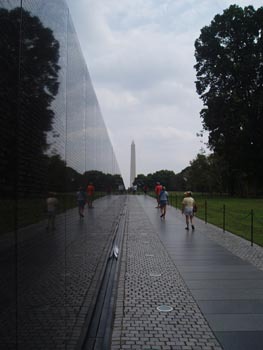 The first place we visited was the Vietnam Veterans Memorial. We both had tears come to our eyes as we walked past the wall. 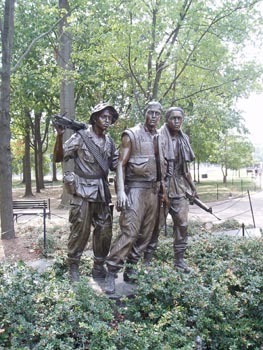 This memorial is a result of a design competition which started after Congress authorized a site in Constitution Gardens on July 1, 1980. After review of 1,421 design entries, a unanimous decision was made by 8 nationally recognized artists declaring a 21 year old art student as the winning designer. 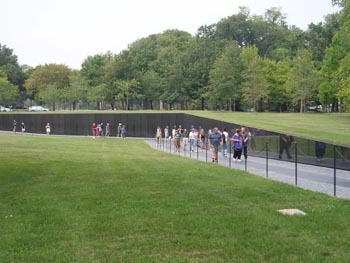 Maya Ying Lin of Athens, Ohio from Yale University was declared the winner in the blind competition. 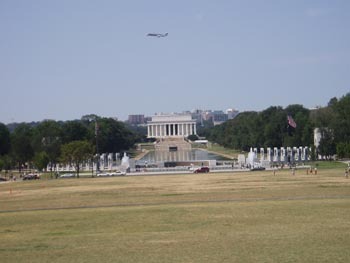 One side of the monument points towards the Lincoln Memorial and the other side points to the Washington Monument. One of the other major design features is the fact that as you walk down you become consumed with the number of names which are engraved in the polished marble creating a private space taking you away from the hustle and bustle of a busy town such as Washington, D.C. Of course the other moving part is the fact that many of the families have brought pictures and information about their sons and daughters who died in Vietnam placing those below their names. 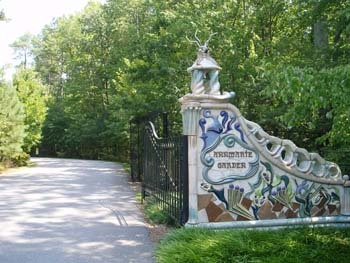 This bring with it the personalization of the names engraved which overcome you as you walk by. Next we biked over to the Korean War Memorial. This is a completely different experience. You can see the antique, now, radios and weapons which the solders are carrying. The large backpacks under the ponchos as they are moving through a field in Korea. 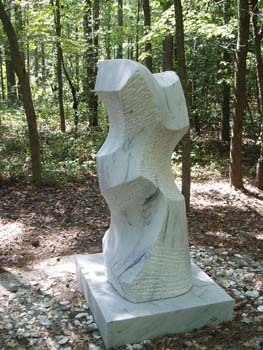 Each sculpture shows a person with a raised sense of awareness on their face. I'm sure by this point it isn't terror, rather a sense of survival that they carry with them. 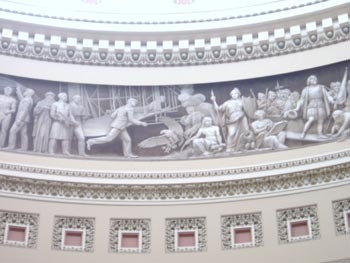 In this case, Frank Gaylord was chosen as the principal sculptor of the statues and then Louis Nelson was selected to create the mural of etched faces on the wall. 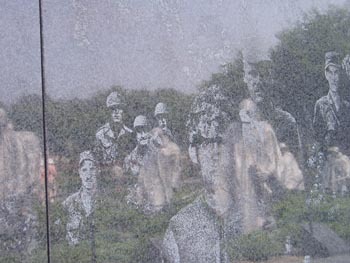 I captured the picture to the lower right which shows the etched faces but in the reflection you can also see the sculpted soldiers in the field which you see to the left. 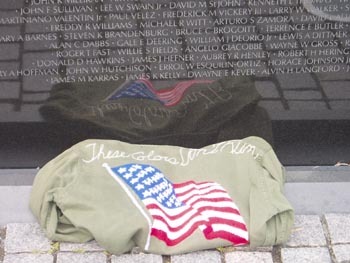 Each memorial is different and with a different effect. 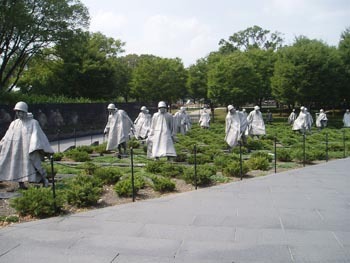 As I walked through the Korean Memorial, I thought about my father who was aboard the Essex when it was hit by a bomb and they fought the fire for over a day to put out the flames and bring the ship home. I know that must have changed his life since he had friends who died during the days that he survived. 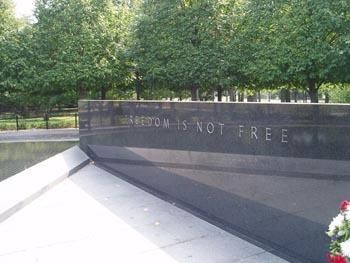 I guess the saying on the wall is correct - Freedom is not free. 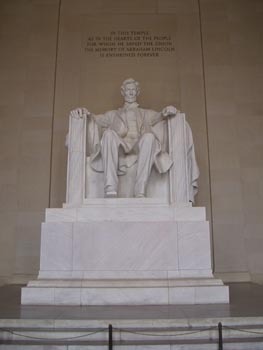 Next we went to the Lincoln Memorial. 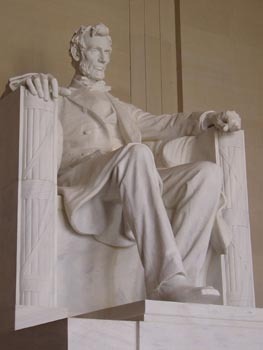 Of course, given my incomplete education, I never really understood what Lincoln was trying to accomplish until today. His entire purpose was to preserve the Union. In many discussions with Congress and the Senate he told them that this was not a war about slavery, it was a war to preserve the Union. As we all know, ultimately, it was in January 1863 that Lincoln issued the Emancipation Proclamation to free slaves within the states in rebellion, thus raising the war to a higher moral plane. In January 1865 he secured Congressional approval of the 13th Amendment that abolished slavery in the United States. "I hate it [slavery] because it deprives our republican example of its just influence in the world -- enables the enemies of free institutions, with plausibility, to taunt us as hypocrites." Next we rode to the White House. The view on the left is after we rode the bikes past the guards that were on this end. 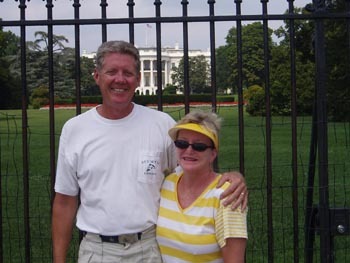 Of course, everyone must have a picture of themselves in front of the White House and this one is ours. 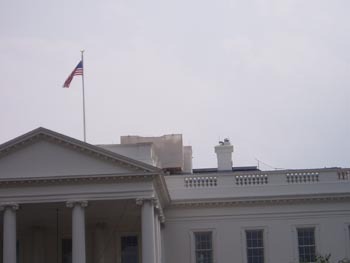 Not the best picture but it is us and it is the White House. 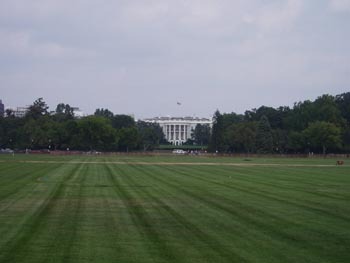 Below right is a better picture of the front of the White House. It really is a beautiful place and I was thinking that it would be really cool to get a tour but that will never happen. Oops, did I say never? I'm wrong!!!!! Another story coming up soon. We found a place to have a late lunch and then rode around to the back of the White House. I had to take the picture to the right because it was clearly unique that there was this white shroud of material on the top of the building. I'm sure it is either a gun of missile placement for defense of the White House. I, of course, hope things like this are NEVER needed, especially tomorrow. 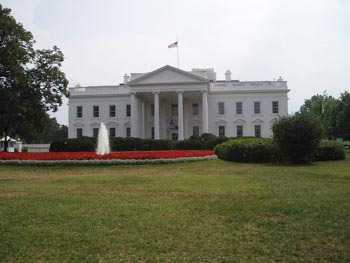 Below is a picture of the rear of the White House and it is a very stately looking entrance as well. 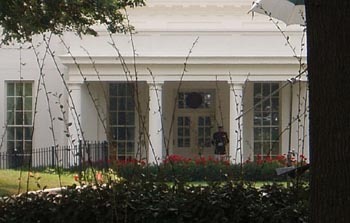 Below right is a picture of the West Wing. 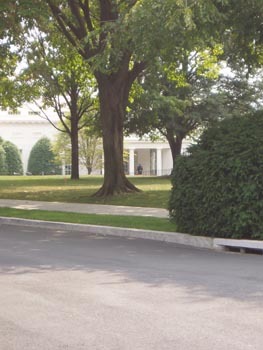 According to a tour guide, we overheard, when there is a Marine guard in full dress outside the door of the West Wing, then the President of the United States is inside working. That meant that today, the President was in the White House and we were only a 100 yards away from the man this country elected to lead our nation. To the left you can see a better picture of the guard that I was able to take and then blow up digitally. I'm sure you can hear me crying about my camera that is getting fixed and I wish I had but still, this is a pretty good picture. Of course what would be a country without freedom of speech. 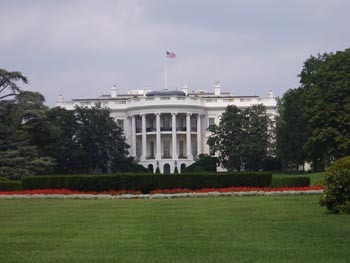 Well, I guess it wouldn't be our country and where else can you see freedom of speech exercised if not Washington D.C. and outside the White House. I just had to take the picture to the right just for all of us. Thanks for the right to say what we believe even though I may or may not believe it. on the lighter side, I just had to take this picture as we rode through China Town. 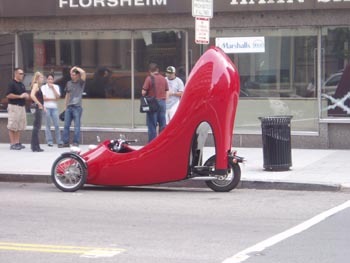 They were setting up for a photo shoot for a shoe store and I guess this was a way of getting attention. Tomorrow, 9-11, we haven't decided what we are doing. We really didn't plan to be here on 9-11 but we are and we my just hang around the area and the boat. I'm not really worried but Deb doesn't really want to be hanging around the Capital Building so who knows. 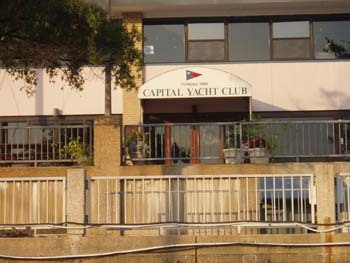 Speaking of the Capital Building, we are set up for a tour on Wednesday through a new friend at the Yacht Club. Too cool! We get to go on a tour Wednesday afternoon and the other really cool news is that we are also going to get to take a tour of the White House late next week. We are truly living the great life! Sept 14 - Sorry, I got behind in my updates. 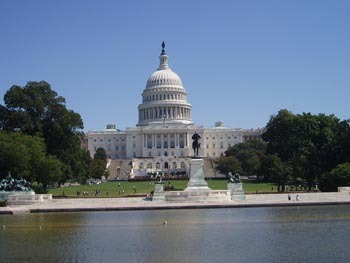 Over the last few days, we visited a few more museums and the Capital. 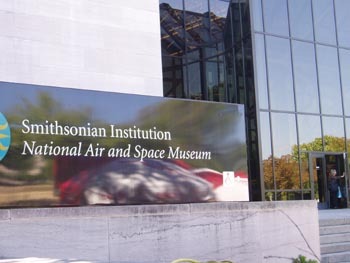 To the right you can see the sign and entrance to the Air and Space Museum. I've been here a number of times although this is the first time for Deb. It is a wonderful museum because it is always changing. An example of change is in the picture to the lower left. Of course this is the ship Rutan designed and was the first private vehicle to take off as an airplane, go into space and then return to land as an airplane. 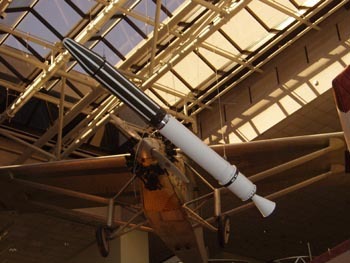 You might remember that first flight where it appeared the plane was out of control, however, control was regained and it went on up to enter space. What a wonderful day for aviation. 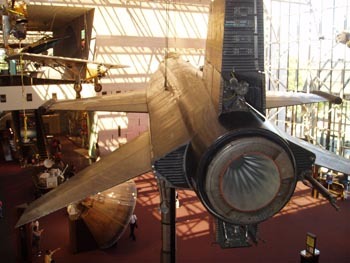 To the lower right, is the X-1. You might also remember that this is the plane that Chuck Yager flew to first break the sound barrier. A speed that many though was unbreakable. 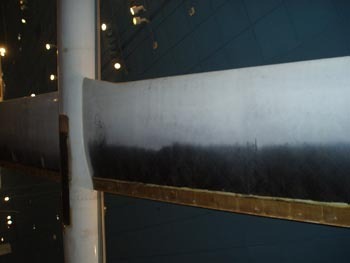 One of the characteristics of this plane is the wing which is not swept back as they are in the subsequent planes. In addition, at those high speeds, the plane's attitude was controlled by trim on the elevator rather than the control stick for the elevator. If I remember right from studying this years ago, the control forces were too high to move the elevator with the stick. Yager figured out he had to use the trim. 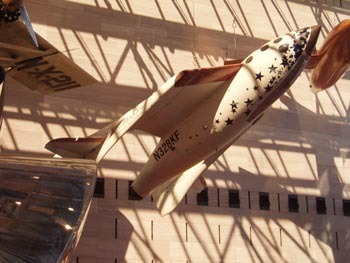 To the left you can see the X-15 rocket plane. This plane, would get dropped from a B-52 (I think) and then it would land in the desert. 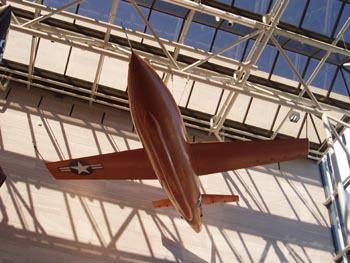 Two wheels would come out below the wing but on the tail, it would land on the skid you see just below the rocket engine. Below left is the satellite that got this country worried. 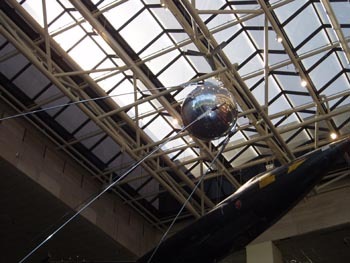 Sputnik. It was the late 50's when all of a sudden we heard a beep, beep, beep coming from space and if you looked up you could see this shinny ball reflecting light back to the earth. The Russians have beat us to space and with a vessel that was larger than anything we had on the board at the time. Lower right is our (USA) first satellite. Of course the space race was born and we ultimately won it with a vision from Kennedy to land on the moon by the end of the decade. We accomplished the vision and spent a bunch of money in the process which has had a number of benefits for everyone. 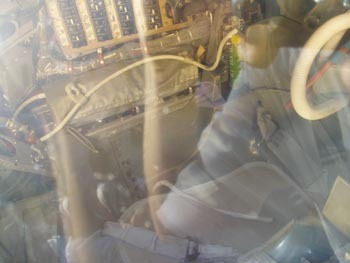 Mercury was the first space manned space capsule. To the left, you can see the somewhat blurry image of the inside of the craft. Of course, John Glen was the first person to circle the earth in Mercury. Amazing. What museum about flight would be worth it's salt without a Wright ship. Of course we aren't talking about any museum here. 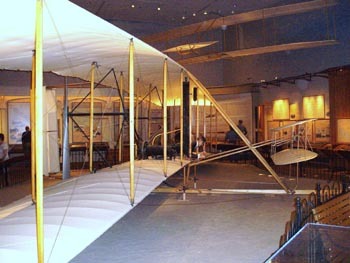 At the Smithsonian, you see the original Wright Flyer. They were the first people to figure out that to control the aircraft, you had to change the shape of the wings and they did this by what was known as wing warping. By using their hips, they would control the wings and they used the stick to control the canard which is in front of the ship. Another person that I would put in the Wright category is Rutan. 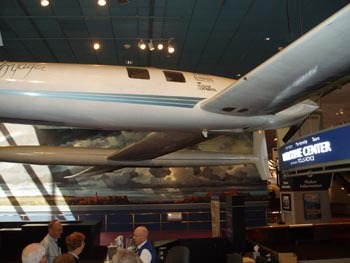 The plane you see below is the Voyager, which was the first aircraft to every fly around the world without refueling. To the right you can see the underneath of the wing was not completely painted. This was done to save weight. As it turns out, if they would have painted this section, they wouldn't have made it. Of course if Jena wouldn't have cut her hair, they wouldn't have made it either. Talk about being close. 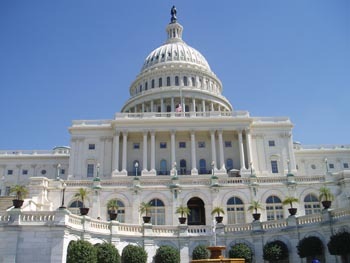 We also were privileged to be able to take a tour of the Capital via Senator Larry Craig's office. We met Bess at the Yacht Club and she was wonderful in that she set this tour and our upcoming White House tour up with his office. 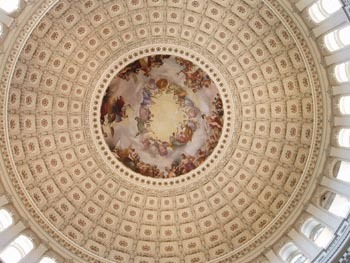 The picture to the right was taken from the front of the Capital. Below left, is a picture taken a bit closer which shows the wonderful architecture of the building. 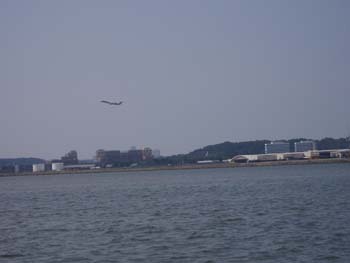 Below right is Lady Liberty. 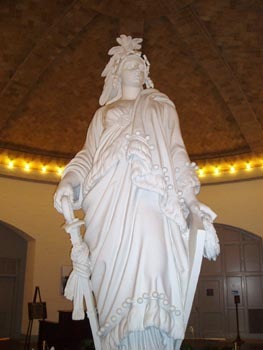 She is located at the base of the Senate Offices and after you see her, you then go through security before you get on the train to go to the Capital. To the left you can see the railway that takes the senator's to the Capital. 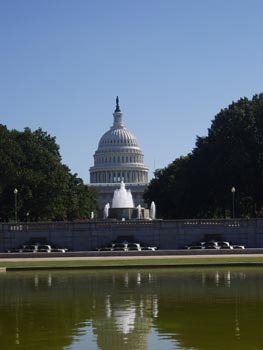 When in session, senators may be in their office until voting begins and then when there are 10-12 minutes left, they stop what they are doing and head for a train so they can vote on time. Of course they also have aids talking to them the entire time about an upcoming bill or issue they need direction about. Below left is the first room we came to entering the Capital. The artwork was beautiful. We found this was done by the artist Brumidi. He was responsible for most of what we saw throughout the Capital. 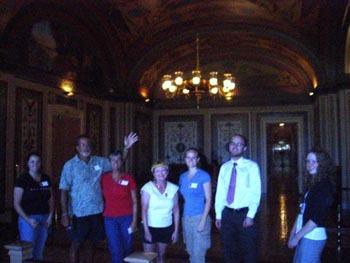 Lower right is a (bad quality) picture of our tour group. Boy do I miss my good camera! Another story but it had to be sent back to the factory by the warranty company to be repaired. Another 4-6 weeks. Regardless, our tour was made up of 6 of us along with 3 interns who work in Senator Craig's office. Once again, this was a great tour and we saw things you would never see on the public tour. All of the panels in the hallway we were proceeding through were not painted, just so the Capital would continue to change with the times. 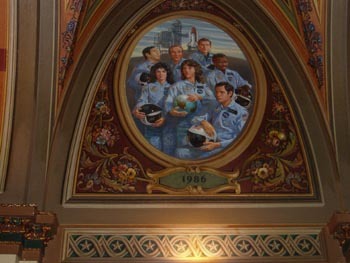 One of the newer pictures is of the crew of the space shuttle flight that blew up when one of the seals failed on the solid rocket boosters and then the flame ignited the main fuel tank. This was a catastrophe and it continues to remind us that every time an astronaut goes up, they are placing their lives in the hands of all of the engineers and builders of a space ship. 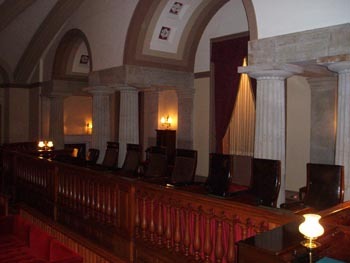 To the lower left, you can see the original Supreme Court. I found it interesting that a new Justice could choose their type of chair and when they left the Supreme Court, they could take their chair with them. 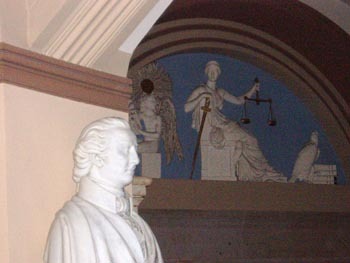 To the lower right, you can see a picture of Lady Justice. Regardless of what Arlo Guthrie said in his song, Alice's Restaurant, you can see here that Justice isn't blind. Being in the original Supreme Court was a great experience. We encountered a number of domes within the Capital. The picture to the right is one I took by putting the camera on time delay and laying it on the floor. You can see the columns supporting the dome and from the center of the painted dome is a beautiful chandelier lighting the dome. 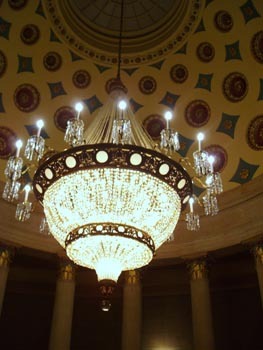 We were able to go up the stairs in this dome and see the chandelier. It was spectacular and if I remember the tour information properly, it was purchased for $1,500. That sounds cheap today until you try to figure out the time value of that purchase. Speaking of domes, the picture to the lower right is the dome of the Capital. 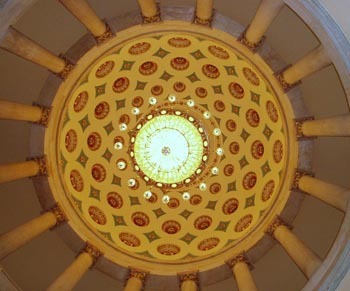 We were told that the Statue of Liberty could be placed in this dome and it would not touch the top. 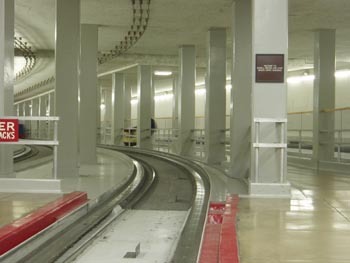 Of course for us to go up there, we would have to have a personal tour with a Senator. Sorry, that wasn't on the agenda for today. 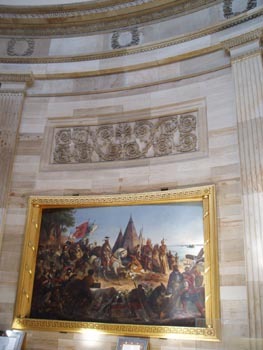 Lower right shows the mural that was painted at the top of the dome. The tour guide even mentioned that there was a bit a sexual overtone here. 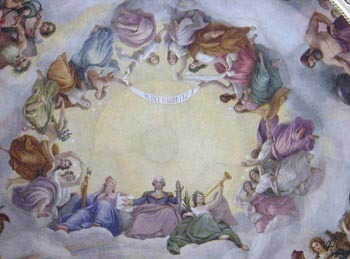 George Washington pictured with 13 different women in, what appears to be, George in heaven. I wonder if today we would have picked a different representation of our first President. 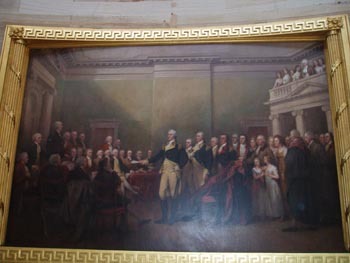 The paintings in the Capital building are amazing. The space is so large the artists understood that the paintings had to be large as well. This was accomplished and it is truly amazing. I really wish we could have had an hour in just this room to be able to look at all of the paintings after we got over the initial view. In the lower pictures, you can see a few of the paintings and in the center you can see the start (on the right center) and end (Wright's plane) of a mural that depicts the history of the United States at the time of this painting. 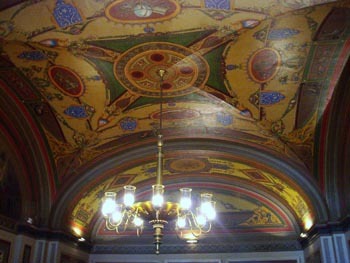 The original artist, Brumidi, died in the middle of painting the mural. Other artists finished the painting and you can see a slight difference in style between the start and end. Regardless, it is truly amazing and as I said, you could spend at least an hour in this room alone. 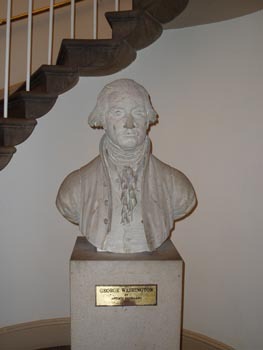 Paintings and sculptures of Washington are all around the Capital building. To the left you can see one of the sculptures we saw on our tour. 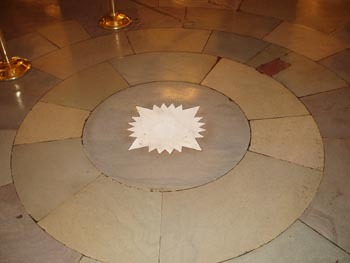 Lower left is the exact center of the Capital although it is on the lowest floor. 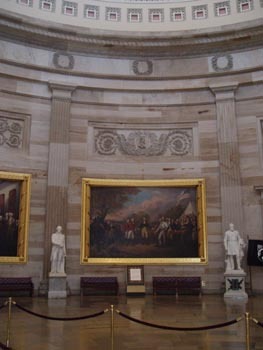 We were told that originally, the architect wanted to have Washington buried here with glass on the floor so you could see his casket. He said he would prefer to be buried in Mt. Vernon. Lower right is a picture we took of the Capital as we were leaving on the west side. Right now, the best two pictures are from the front and the west side because they have a security entrance on the east side that is somewhat temporary and there is construction on the north side for a new visitors center. I guess this is a result of 9-11 and an unfortunate state of the world today. I remember when I was on a national committee years ago and I would simply walk up the front steps of the Capital and wonder the halls. 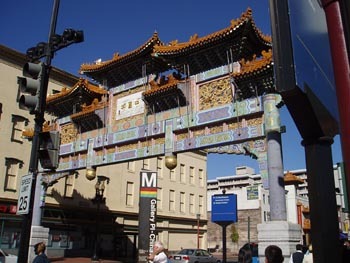 We left the Capital and rode our bikes over to China Town. We didn't spend long on this day but did come back again. Well that is another update and I'll try to get that one out tomorrow.